In order to integrate MadeToPrint Server with K4 5.9 publishing system, some further adjustments are required. Users have to enter a valid name in combination with a password, otherwise MadeToPrint Server would log out after every job having been executed. 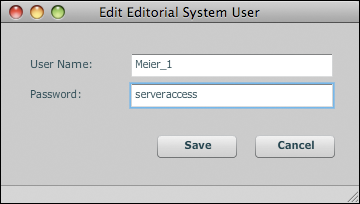 Click on the Editorial button within the MadeToPrint Server run dialogue. Enter a valid user name and a password to log on to the K4 5.9 system permanently. Click on Save to confirm the log on. MadeToPrint Server is ready for use with K4 5.9 now.